Cycling is a good mean of stressbuster and certainly a mood booster. Like every other change, the design of a cycle, as well as the motive of cycling has seen a revolution. The word cycle or bicycle is passe, the latest trend is, to call it a bike and mountain bike is the upgraded version. Unlike normal bikes, a mountain bike is far more advanced in its every single feature. All these exciting features make the ride on such bikes far more exciting and adventurous, a strong metaphor of flying towards the dangerous journey. So it is logical not to cut the wings but to take necessary measures to prevent casualty. The first step of precaution is owning a good mountain bike helmet. Nothing is more important than safeguarding one’s body, health, and skull. The bug of speed and adventure can wait till we put the helmet before starting the journey. After a long and vigorous assessment, here we have compiled a list on 10 best MTB Helmet. Check it out before buying your helmet. 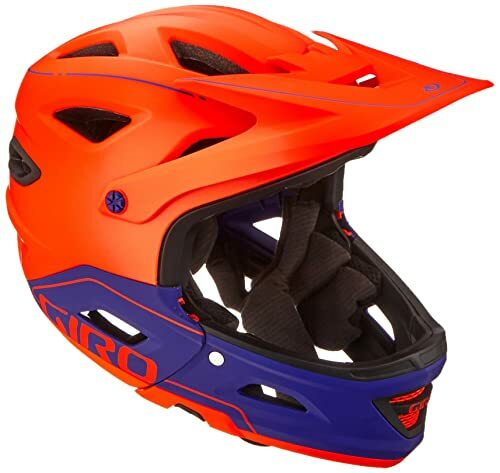 Giro is a known brand for making helmets, goggles, bikes, and many other products. It has introduced and added some major features to its helmet time to time. Giro Switchblade helmet is one of those unique inventories. What makes this helmet different from other helmet is its removable chin guard. It is a dual purpose helmet where it can be used with both the chin guard on and off. For normal riding, one can take off the chin guard and use it as a half-shell trail helmet. But when one gets to the top of the climb, the chin guard can be reinstalled and ensure full-face downhill protection. 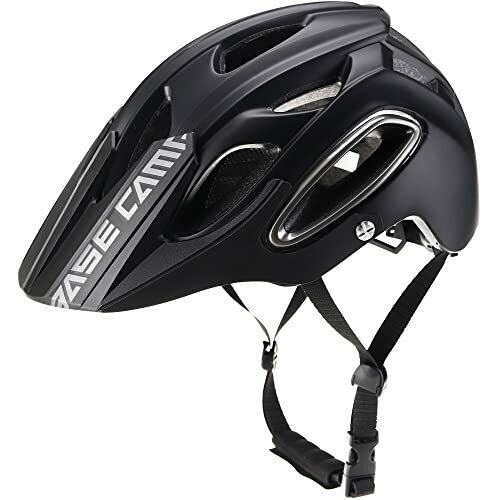 The helmet is ASTM downhill certified both with and without the chin guard which means it has passed the safety tests. Certainly a top contender for the best mountain bike helmet. Not only it has dual use of chin guard but also comes up with two visors, a normal visor and also a visor with GoPro mount. All in all a versatile helmet with great features which includes MIPS and Roc Loc Air DH Fit system. Bell had introduced the Super 2R feature in one of their previous helmets where it had a removable chin bar and high protection. This time they have introduced Bell Super 3R Helmet. The upgrade of 2R to 3R has bettered the retention system. The unique retention system is known as Float Fit where with just a click on a dial, the fit system automatically snugs the head matching the exact shape of the head. It has used better MIPS technology. Cheek pads can be removed from the chin bar allowing the helmet to be more versatile for different face shapes. It has 23 vents all over the helmet for smooth airflow. 6 on the chin guard and also has 4 brow ports. Xstatic padding has been used in this helmet. Xstatic padding is that feature which helps to keep the head cool when it’s warm and vice-versa. 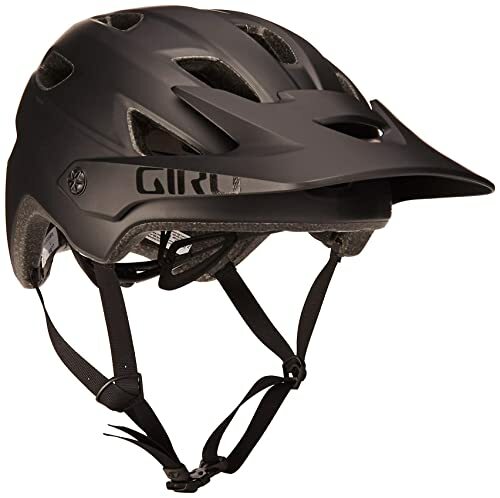 Giro Montaro helmet is designed for long days spent in the trails. The look of the helmet is simple but sleek. The in-mold Polycarbonate, Roll-cage reinforcement, and EPS liner form a solid base to protect the skull from any blow. EPS liner as we all know absorb the energies of an impact and Roll-cage reinforcement is kind of a nylon web which is molded into polystyrene. MIPS technology is used in the form of a thin lining in the innermost layer which reduces rotational forces and elevates the safety level. It also features Roc Loc 5 fit system. The sufficient padding used in the helmet is hydrophilic and antimicrobial. The padding is also Xstatic which helps to balance the temperature around the head efficiently. It has integrated camera mount with a breakaway design to save the camera in emergencies. Adjustable visor allows the goggles to stay put on the front of the helmet and the strap grippers at the back hold the goggles at its place. Smith Forefront Helmet is made of a unique material named Koroyd. The Smith team is by far the only team who has successfully used this material to form the honeycomb structure through Aerocore technology. Koroyd tubes are tiny and stacked together in such a way that it creates a honeycomb design. This technology is the reason for being this helmet so lightweight. This specific honeycomb structure helps to create better airflow. As the structure is very different from the traditional EPS foam used in the helmet, very less amount of materials is required which makes the helmet very light but sturdy and allows more space for airflow. The AirEvac system used in the helmet moves hot air away from the glasses and stops lens fogging. The visor is comparatively small and ensures proper viewing without any hindrances. It has three positions peak to move it up or down. The helmet has got a GoPro and light mount also a strap which holds the goggles. 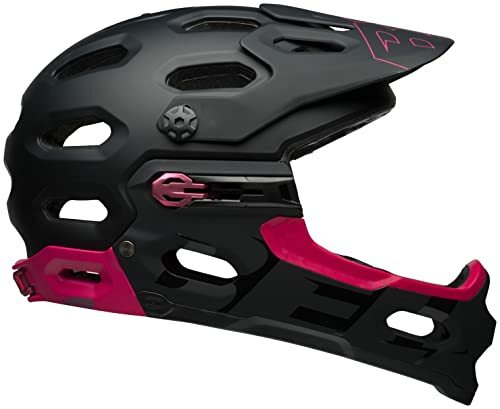 Giro is undoubtedly a winner when it comes to making the best MTB helmet. The quality is top notch. Sharp design and the shape of the helmet is such that it comfortably snugs the head. This helmet uses MIPS technology where the outer layer of the helmet moves and the inner layer stays put once it is adjusted. This allows the helmet to rotate around the head. Padding covers all the exposed region around the head ensuring full protection. Coolmax pad lasts longer and absorbs sweat remarkably well. Due to Coolmax padding, the moisture also dries quickly. The visor is pretty long and the goggle fits properly on the front of the visor. The Roc Loc 5 fit system allows controlling the adjustment of the helmet with a ratcheting micro-adjusting dial using a single hand. A twist in the dial opens the retention system and another twist closes it. Each click in the dial is audible. 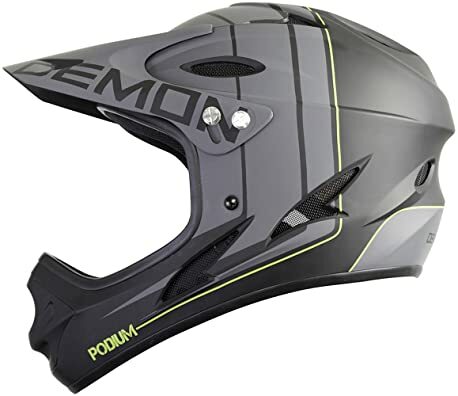 As the name suggests Demon podium is a full face helmet with a well-padded chin guard. The chin guard is attached and not removable. Made of Polycarbonate, the outer shell is solid but light. The way padding is done in this helmet that itself shows how well the helmet can protect the head. Once the helmet is worn, it stays put at the place and doesn’t woggle at all. So if one is going to have an adventurous ride, the helmet will offer good protection. The helmet is CPSC certified so well-made guaranteed. It has an adjustable visor that moves up and down also an additional visor which is mostly an optional one to add a little bling to the helmet. The vents are placed strategically. The airflow is smooth keeping the inside of the helmet cooler. It also comes with a helmet bag which is convenient for carrying the helmet. 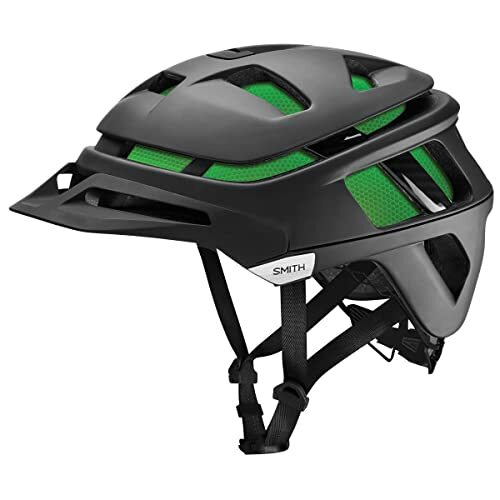 If you are searching for an affordable helmet to go on a ride on rough and technical terrain, then NEO helmet is for you. 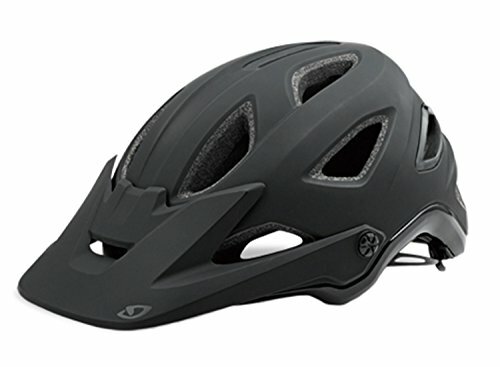 Compared to other helmets it comes on a very affordable price but ensures some great features. It is certified by both CPSC and CE.EN 1078 which means it has passed all the safety tests. Quality material is used to make the outer shell and feels very light on the head. It has 18 large vents hence the airflow is smooth and keeps the head cool and comfortable. The visor is adjustable, also can be removed if needed. 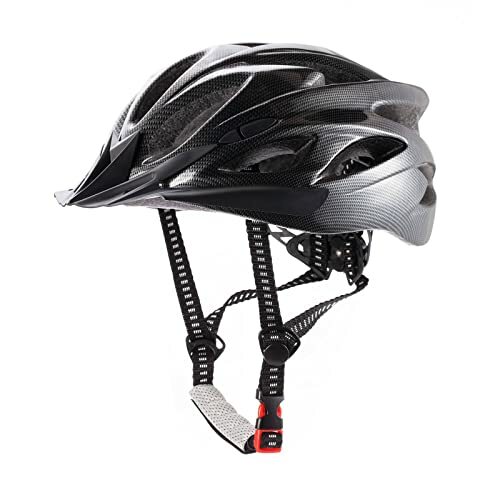 The helmet incorporates SH-18 adjustable retention system which makes for an easy fit. There are four adjustable dials or buckles in the helmet. One at the rear, one on both the side of the ears and a basic one to fasten the helmet underneath the chin. The foam that is used at the bottom side of the helmet is laminated. CCTRO helmet is the best cycling helmet which costs almost nothing compared to other brands. Even though it is very low priced but it certainly doesn’t compromise with the quality of the product. If one is not keen to spend a lot on a helmet, then this is the helmet they need to have. It is lightweight, made of Polycarbonate. It is well-padded ensuring high protection and the brow pad can be removed and washed. It has adjustor within to adjust the helmet according to the circumference of the head. The chin strap has padding too which is not seen in most of the other helmets. EPS liner is used to absorb the energies that are created from impacts. Browpad is there to manage and absorb extensive sweat while heavy peddling. This helmet is said to be eco-friendly and we need such eco-friendly products more. The easy-use dial system makes the fit of the helmet convenient and simple. Airflow is great as it has 18 vents to move the hot air away. Just like the Giro helmets, Base Camp also has to be the hot favorite on our list. Slightly different design compared to other helmets available in the market, it sits snuggling on the head. It is so lightweight and cleverly designed that you can hardly feel something on your head. Not only the eye-catching design but also the magnetically fastened optical shield helps this helmet to stand out. Bring the visor on the front of the helmet and immediately it gets attached to the helmet with the help of the strong magnet. Once clipped the visor hardly moves until you try to detach it. The visor is made of acrylic glass. In our opinion, this helmet is by far the most stylish one and magnetic visor plays a very important role to enhance the look of the helmet. The visor is so great that glasses can be put on within the visor easily. 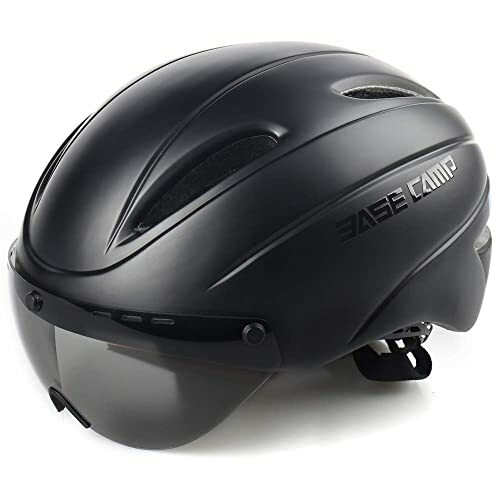 Basecamp specialized bike helmet is made of high-quality materials like PVC and high-density PC. The outer shell is sturdy and EPS foam protects the head from massive impacts. The visor protects from the sunlight pretty well and is detachable when needed. Its special feature is the LED safety tail light which ensures safety for both day and night riding. The tail light works on three modes that are steady, slow and fast flashing. The ventilation through 22 vents not only ensures cooling within the helmet but also helps to increase the speed. Paddings are made from breathable material and can be washed. EPS liners and padding ensures high protection. Sweat absorption is good during rigid peddling. The straps are adjustable and there are two holes for different head shape. There is also a dial at the rear to adjust the fit. 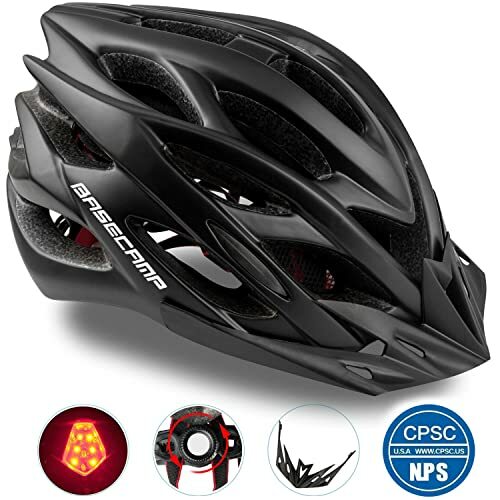 The helmet is CPSC certified yet it is available at a very reasonable price. Now when we have finally come to the end of the list what you have understood with this assessment is how the helmet has changed the game drastically. The purpose of a helmet is to conserve the skull, but it is easier said than done. Time to time new technology is introduced to elevate the level of safety a helmet offers. Mountain bikes are adventurous hence risky, so spending on a good helmet is essential to lessen the risk factor. Our review of the 10 Best MTB Helmet covers up all the information you need to know before buying your helmet. Each of these helmets has kept their basic features intact but added some extra features for varied conditions. A mountain bike rider will definitely have a clear idea of his or her need. We have tried to keep our list versatile by putting some of the most expensive ones as well as the affordable ones which even though being affordable doesn’t compromise the quality. So, we hope this will help our readers to choose what is best for them and have a safe journey keeping the adventure intact.